Please note that many of these films are now available for borrowing from the Loudoun campus library. Agoniia (Rasputin), 1981, directed by Elem Klimov. CTE: Completed in 1975, this film was to be shown in connection with the sixtieth anniversary of the Bolshevik Revolution (1977), but it never made it to the screen as Soviet censorship objected to something about the movie. It was finally shown at the 1981 Moscow Film Festival and then resurfaced internationally in a severely edited version in 1985. This is not a great film, and it does not come close to capturing on film the scandalous debauchery that was Rasputin, nor his real intimacy with the imperial family. The movie does try to show the graft and corruption present in Imperial Russia during World War I, but even that is under-stated. The film is interesting for the inter-splicing of simulated black-and-white newsreel footage, actual archival footage and scenes from earlier Soviet-era films, such as those by Sergei Eisenstein and Vsevolod Pudovkin. 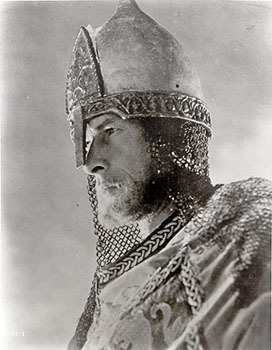 *Aleksandr Nevskii (Alexander Nevsky), 1938, directed by Sergei Eisenstein, with music by Sergei Prokofiev. CTE: The movie, released in 1938, had an obvious patriotic propaganda appeal and also contained an implicit message directed at Nazi Germany--"Germans tried once before to defeat Russia and failed; you, too, shall fail if you try." There are a lot of over-simplifications in the film, and a lot of examples of crude propaganda, and the depiction of the battle on ice, the crucial battle on Lake Peipus where Nevskii's Russian forces defeated the Teutonic knights, is generally inaccurate--historians still disagree on the details of the battle and the Teutonic invasion. But still this movie is worth watching: (1) there is absolutely the great musical score by Sergei Prokofiev, one of the most brilliant Russian composers of the twentieth century; (2) there are incredible scenes such as the one in which Russian peasants arise out of their earthen dugouts--yes, that is where they lived--; or (3) the realistic costuming of the Teutonic knights. ps. Some years ago, I saw the film at Wolf Trap National Park with the National Symphony Orchestra playing Prokofiev's score. What a great experience. BB: I feel very strongly about this film, and remember clearly and fondly first seeing it as a grad student in the late ‘60s. In fact, I dug out my ageless, dusty Melodiya 33rpm record of the Prokofiev cantata and it’s blaring away as I type these lines. The film, made in 1938, foretells a modern war between Nazi Germany and Soviet Russia by reprising the thirteenth-century battle between the invading Teutonic knights and the stalwart forces of a prince of Novgorod. Until the rise of Hitler and the threat he posed, the Soviets treated pre-Soviet Russian history as no more than a cascading story of oppression and class antagonisms. When war with Germany began to look almost certain, respect was again paid to pre-Soviet martial heroes such as Prince Alexander, who was two-for-two when fighting on the ice. He defeated the invading Swedes, earning his honorific Nevsky, on the frozen river Neva a few years before defeating the crusading knights on frozen Lake Peipus. To prove that nothing is as simple as it may appear, Alexander decided it was better to switch than fight when the Mongols came along, and collaborated with them til the end of his days. Speaking of collaboration, a brilliant foursome is responsible for this film… Eisenstein as director; his partner, Sergei Prokofiev, whose score for Nevsky is probably the best "movie music" ever composed; Edward Tisse, Eisenstein’s long-time collaborator as cinematographer; and Nikolai Cherkasov in the title role as Alexander. Cherkasov would later appear also in Eisenstein’s Ivan the Terrible films, but in those he's an overwrought, evil oil slick. Here he is, I think, unforgettably heroic. The film was intended to stir patriotism in the run-up to the expected confrontation with the Nazis, but when the Hitler-Stalin non-aggression pact came along in August 1939, the film had to stay in the cans. It was, of course, given a quick national re-release after the June 1941 invasion. I’ve seen the film countless times, having screened it often for both Russian history and Soviet cinema classes, but my closest encounter with an element of the genius underlying this collaborative masterwork was being present in April 1991 for a performance of the Prokofiev cantata conducted by Mstislav Rostropovich, Prokofiev’s one-time protégé. Rostropovich’s love for the composer was palpable as he called forth the best the National Symphony Orchestra had in an unforgettable tribute marking Prokofiev’s hundredth birthday, as well as the fiftieth anniversary of the fateful Operation Barbarossa. Watch it, suspend some disbelief for this 1930s warhorse, and I genuinely believe you'll like it. Among those who went to school on Eisenstein’s first sound film, by the way, was Laurence Olivier, whose 1945 Henry the Fifth owes much to Nevsky. *Andrei Rublev, 1966, directed by Andrei Tarkovsky. The film, based on the life of the medieval Russian icon painter, was only shown in Russia, in a much abridged format, in 1972; that was three years after winning the International Critics Prize at the Cannes Film Festival. Soviet censors edited the film, removing up to an hour from the original. Reading the plot description at imdb will certainly help you understand the movie. You can also read the notes by Alan Kimball, University of Oregon, A Guide to Fifty Minutes Worth of "Andrei Rublev". CTE: Far from being a masterpiece, in my opinion, the movie can be long, disjointed and completely non-understandable. There are some good scenes about the depravities of medieval Russian life and the impact that the Mongols (Tatars) had on the Russian people: suddenly the Mongols appear; there is terror and destruction; and then they are gone. You get very little sense of the intellectual and spiritual motivations of Rublev, which is perhaps understandable given the lack of surviving historical sources about him. We've got one of those color switches (Remember the Wizard of Oz) when the final section of the movie shifts to a color montage of some of Rublev's surviving icons, but that gives only a hint of what was so powerful about his work. *Anna Karenina, 1967, directed by Alexander Zarkhi. CTE: There have been numerous attempts to make a movie based on Tolstoy's novel; most are not very successful. My suggestion is "Read the book." This particular film does follow the novel rather closely, with soe nice costuming, but, of course, so much had to be left out of the movie. The film tends to highlight the weaknesses, immorality, depravity, /etc. of the characters, which fit with Societ society in the mid-1960s, but that was not quite Tolstoy's entire intention in his novel. "Read the book" and then maybe watch the movie. *Ballada o Soldate (Ballad of a Soldier), 1960, directed by Grigorii Chukhrai. Make sure you see the sub-titled print and not the dubbed version. CTE: Filmed in 1959, only 14 years after World War II had ended and in the midst of the Thaw, sweeping the Soviet Union, the movie is unbelievably corny in places. The cinematography is nothing special, black and white, but if you don't cry when Alyosha finally reaches his mother while on leave from the front, then you have no heart! So, it is worth watching. BB: This was the first Soviet film I ever saw. I was an undergraduate student taking first-semester intro course in Russian language and this film was used as a "text" by my instructor. That is, we watched the film several times and also used the film's audio track in language lab exercises. This made me tire of it, and when I first taught a course in "Soviet Cinema," I omitted Chukhrai's film. In a later version of the course, I screened Ballad of a Soldier, and think it will always be an affecting film for traditional-age undergraduates because Alyosha and Shura are themselves both about 20. Now that I'm much older even than the mother character, I am still much affected by the film's pathos. It's been called "socialist realism with a human face," and I think this is an accurate summation. Boris Godunov. There are many versions available of this opera. 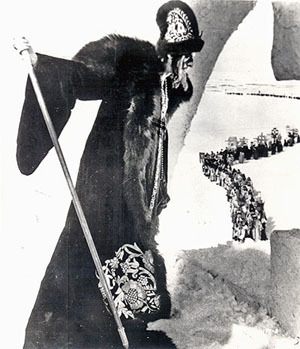 I watched the 1978 version of Modest Mussorgsky's opera, Boris Godunov. This is generally considered the greatest of all Russian operas, and let me warn you that operas can be long and slow-moving, and this is no exception. But what makes this opera a bit unique is that the title role must be song by a bass, not a tenor or baritone! So, the opera that I watched was filmed live at Moscow's Bolshoi Theatre in 1978 and featured the renowned Russian bass Evgenii Nesterenko in the title role. Ok, it is a bit long, and at places Nesterenko seems to be lacking any real pathos, but at the very least watch the magnificent coronation scene. There is also available a 1954 version of the opera, also filmed at the Bolshoi, that stars Aleksandr Pirogov. Finally, there is a 1986 dramatic version based on Aleksandr Pushkin’s story. This version is directed by Sergei Bondarchuk with Bondarchuk also playing the lead role as Godunov. The drama has received much praise for its outstanding photography and production design. So, enjoy this most Russian of Russian historical tales in whichever version you choose. *Bronenosets Potemkin (Battleship Potemkin), 1925, directed by Sergei Eisenstein. The film depicts the mutiny of sailors aboard the Battleship Potemkin during the 1905 Russian Revolution. The original mutiny took place 14-25 June 1905. Sailors protested the quality of the meat being served them, but an official doctor said that it was ok for human consumption. When the sailor leading the delegation to the officers was killed , a mutiny ensued, and the senior officers on the ship were killed. The ship arrived at Odessa on the 15th hoping to arrouse the support of workers for the mutiny. City authorities did allow the burial of the dead sailor but would not grant an amnesty to the mutineers. The ships guns then briefly bombarded the city. Eventually, the sailors ended up in Romania where they were given safe passage to Western Europe. CTE: The film was originally commissioned by the Soviet government to commemorate the 1905 Revolution. Eisenstein then chose to focus on the mutiny of the sailors on the Battleship Potemkin in Odessa. The sailors had revolted because of their absolutely horrible service conditions (including rancid meat) and the unrest in Russian in 1905 as a result of the Russo-Japanese war. Although the recreation of the historical details of the incident leaves much to be desired, the film is still an Eisenstein triumph with his "rhythmic editing" technique and the famous Odessa Steps scene in which the Cossacks gun down rioters and innocent bystanders. The actors in the film were amateurs, selected by Eisenstein because of their "rightness" for the roles. Remember this film was shot in 1925, a relatively good year for the Bolshevik Regime, and reflects the Bolshevik view of the world at that time. Robert Brown, Assistant Professor of Film, Loudoun Campus: Even though Potemkin appears to have lost some of its luster among film critics as being one of the finest films ever made, the film is still considered quite powerful due to the intensity served to viewers by director Sergei Eisenstein in the scene known as the "Odessa Steps Sequence." If D.W. Griffith, in Birth of a Nation was able to transform film into an art form with the "shot," then Eisenstein, in the "Odessa Step Sequence" made the emerging art form more malleable of space and time using the technique of montage editing. The sequence, even by today's standards of editing, is majestic, and at the same time, horrific, due to the mixture of images and the expansion of time and rhythm parlayed by Eisenstein. While it seems in most modern-day films editing is used to collapse time in order to make the drama presented more intense (see any "Action" film of today), Eisenstein in does the opposite. And in so doing, presents to us what seems a kind of surreal time frame of expansion that prolongs the drama on film and makes us not only see but feel with horrific intensity. BB: Eisenstein’s Potemkin (pronounced Po-tchom-kin) remains a cinematic touchstone. It’s a staple of "ten best" movie lists, including the one done every ten years (beginning in 1952) by Sight and Sound (the 2002 list had it at #7). Critics always acknowledge Eisenstein’s brilliant montage editing ("Art is conflict," he wrote in Film Form, and he was always striving for a "dialectical" clash of images.) but often find this film "unlikable" (Pauline Kael). In the still breath-taking "Odessa Steps" sequence, there are 112 cuts flying past in no more than about 60 seconds. *Chapayev (Chapayev), 1934, directed by Georgy Vasilyev and Sergei Vasilyev. CTE: Despite the endless kudos for this film (for example, “vivid, multi-leveled biographical/historical drama that remains as gut-wrenchingly powerful today as when first released,” Video Yesteryear), it takes a lot of patience to sit through the ninety minutes of this film. Extremely simplistic, but then again, not sure what more could be expected out of Russia in 1934, the early years of the Stalinist regine. There is nothing technically-innovative to the film or its cinematography. 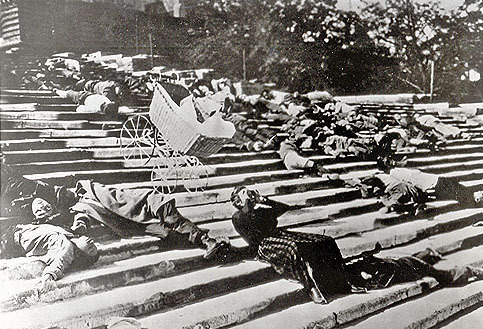 In the movie, you will see one of the hallmark features of early Russian cinema, crowds of people running everywhere. Look, the Russian Civil War was not this clear-cut (good guys-bad guys); nor was it this easily won; nor was it so bloodless. The film, based on the memoirs of commissar Dmitrii Furmanov, probably does not do true justice to the exploits of Vasilii Chapayev, killed in action in 1919 while commanding the Red Army's Twenty-Fifth infantry division against the Whites. I kept thinking of the movie Burnt by the Sun as I watched this movie. If Chapayev had lived, he would probably have ended up as the main character in Burnt by the Sun. Anyway, this movie is Soviet myth-making at its best. The movie debuted on 7 November 1934, the seventeenth anniversary of the revolution. Charge of the Light Brigade, 1936, directed by Michael Curtiz. CTE: This epic Hollywood film stars Errol Flynn and Olivia de Havilland, and it is worth watching to just see these two stars on the big screen. The movie has almost nothing in the film about Russia, and it does not even have much in connection with the Crimean War; and there is little historically relevant here too. Most of the film focuses on the British imperial mission in India, and the film can be considered quite “orientalist” in character. The idea of "orientalism" roughly means that distorted western ideas of what constituted life in the "east" are substituted for the reality of what that life was really like. For example, the movie images of the glamourous court life of the sultan are reflective of imagined, western ideas of what that court life was. So, this film actually reveals quite a bit about the mindset of the 1930s when it was made. So to sum up, there is little historical accuracy here, a lot of elaborate sets, lot of action, great stars, and worth seeing. Charge of the Light Brigade, 1968, directed by Tony Richardson. CTE: This movie is one of the reasons that I do not like a lot of British film, the slow, melodramatic pace, the stupid romances, the Victorian costuming and speech, the posturing. The film tries to be an anti-war film (1968!) and depicts the senseless nature of the charge of the Light Brigade at Balaclava (25 October 1854) when six hundred British cavalrymen were essentially lead to attack a fortified Russian position with heavy casualties, due to the incompetence of British officers--no doubt, they truly were incompetent. The film is also intended to be an antidote to the stirring poem of Alfred Lord Tennyson. This is an oversimplified view of class structured British society, and the film does not come close to capturing the brutality of the Crimean campaign (from either Russian or the Anglo-French sides). An awful lot of men died there in terrible conditions. There is absolutely no examination of the Russian side in this movie. The only redeeming quality of the film is in the truly great animation scenes. CTE: Well, this is about an hour long silent movie recently restored with orchestral accompainment from the director's original musical notes. It was clearly experimental at the time it was created, establishing several possible new directions in "world" cinema. There are basically no words or sub-titles, just the film snips of one day in the life of a Russian city (filmed in Odessa, Moscow and St. Petersburg). I thought, what the heck, I'll skim through it and see what I can learn about life in the late 1920s in the Soviet Union. I ended up watching twice and learning a lot--the sports scenes are just incredible and much better that what Leni Riefenstahl would do with Olympia in 1936. I was absolutely amazed by the camera work of Mikhail Kaufman, and the editing, a kind of hyper-quick editing, of Vertov who used all kinds of different cinematic techniques in the film. Big thumbs up. *Dama s sobachkoi (Lady with the Dog), 1959, directed by Iosif Kheifits. CTE: Well, if you want to get a glimpse of what Anton Chekhov, the Russian dramatist, is all about without going to see one of his plays on stage or reading one of them, then you can watch this move. I've never been a big fan of Chekhov, the slow dialogue, slow activity, slow movements, pauses, each line slowly delivered as if it has fallen from the sky drenched with subliminal meaning, and so on. Some careful fast-forwarding will get you through some of the slow moments of the film that deals with an extra-marital relationship in turn-of-the-century Russia. The dog is fun, anyways. Black-and-white film in 1959! Dersu Uzala, 1975, directed by Akira Kurosawa. Won the 1975 Academy Award for Best Foreign Language Film. CTE: The movie was co-scripted and directed by Kurosawa, shortly after he had failed to kill himself in a suicide attempt, and it was based on Vladimir Arseniev's (1872-1930) In the Jungles of Ussuri. I was going to make some inane remarks like, "It's the Russian Jeremiah Johnson" (or Grizzly Adams), but that would be demeaning to this brilliant movie. The viewer gets some feel for the vastness of Siberia and how pristine Siberia still was at the turn of the twentieth century. Well worth watching. Many thumbs up! Dezertir (Deserter), 1934, directed by Vsevolod Pudovkin. CTE: The film is loosely based on a strike by dock workers in Hamburg, Germany and the German workers sending a team of representatives to the Soviet Union for advice and support. You can tell that the film was made in 1934 in regards to the propaganda for the heavy industrialization of Russia being carried out under the first and second five-year-plans os Talin. Kind of an interesting film. Very early, Russian sound film! Detstvo Gorkogo (The Childhood of Maksim Gorkii, 1938, directed by Mark Donskoi. CTE: This was the first of director Mark Donskoi's trilogy based on Gorkii's three-volume memoirs, one of Russia's most important writers of the twentieth century and a kind-of supporter of the Bolshevik regime. Stunning cinematography along the Volga River really captures the feel of nineteenth-century Russia. Sure some of Gorkii's memoirs had to be changed to fit the conditions of 1938 Stalinist Russia--Gorkii was dead by this time--and I'm not sure if any movie could quite capture in realistic terms the brutality surrounding Gorkii's childhood, but this film is definitely worth seeing to understand something of the lower classes in Russia. *Doctor Zhivago, 1965, directed by David Lean. Movie won the 1965 Golden Globe for Best Picture. CTE: This was another of David Lean's magnificent Hollywood epic films from the 1960s loosely based on Boris Pasternak's novel, Dr. Zhivago, which had led to Pasternak being awarded the Noble Prize for Literature. The publication of that novel in 1958 outside of Russia had caused real problems for Pasternak in Russia, and he "agreed" to turn down the Nobel Prize. This film is mostly a Hollywood love story, not shot in Russia, not using Russian actors, maybe using some Balalaika music for authenticity. Despite a lot of problems with the film there are some magnificent acting performances (Rod Steiger as Komarovsky, Tom Courtenay as Pasha Strelnikov, Alec Guinness as Yevgraf). Then there is the finger-snap scene as Alec Guinness (Yevgraf) appears in Zhivago's apartment; the movie is worth watching just for that one scene. But read the book instead; it is much different. Dr. Strangelove or How I Learned to Stop Worrying and Love the Bomb (1964), directed by Stanley Kubrick. CTE: One of the greatest movies ever made and featuring an all-star cast with Peter Sellers playing three different roles. Unbelievable black comedy, maybe the best film satire ever made, that pokes fun at the seriousness of the Cold War just a few years after the tensions of the Cuban Missile Crisis. In the film, a crazy American general launches a nuclear attack against the Russians to preserve our “bodily fluids"; things go downhill from there. You must see this film to get an idea of how ridiculous much of the Cold War's peacock strutting really was. Dvenadtsat Stulyev (The Twelve Chairs), 1971, directed by Leonid Gaidai. CTE: This is based on the on the satirical Russian novel, The Twelve Chairs, written by Ilya Ilf and Evgenii Petrov. Supposedly the family jewels have been hidden in one of a set of twelve chairs from a rich family before the Revolution. Now it's 1927, and one of the relatives and a con man attempt to find the money; very funny, slapstick comedy. There is also a version by Mel Brooks. Fiddler on the Roof, 1971, directed by Norman Jewison. Won the 1971 Golden Globe for Best Picture Musical or Comedy. CTE: Despite the great songs, the comedy, the fact that this was/is essentially a Broadway musical, Fiddler on the Roof still offers excellent insight into the complex Russian-Jewish relationship at the turn of the twentieth century and the nature of Jewish family life in the Russian countryside. Stereotypes aside, most Jews that lived in the Russian Empire were poor peasants, and competition for scarce economic resources could lead to trouble between Russian and Jews. Remember there were a lot of Jews living in the Western provinces of the Russian Empire before World War I, upwards of seventy percent of the population in some areas. Russian authorities inflamed anti-semitic sentiment among the Russian peasants to keep Russian minds off more serious problems. It was the Russians who invented the “pogrom,” the anti-Jewish riot. Topol, in the role of Tevye, is brilliant. The Fixer, 1968, directed by John Frankenheimer. CTE: This is a film adaptation of Bernard Malamud's novel of the same name; the novel won a National Book Award and Pulitzer Prize. The story is largely based on the notorious anti-Semitic Beilis case in pre-revolutionary Russia when Mendel Beilis, a Jew, was accused of a ritual murder of a Christian boy in Kiev. After being held in prison under brutal conditions from 1911 to 1913, Beilis was only finally brought to trial after enormous public pressure from around the world was applied to the tsarist regime; Beilis was found not guilty. The film is very well done and will quickly show you everything that was bad about life in tsarist Russia under Nicholas II. *Idi i Smotri (Come and See), 1985, directed by Elem Klimov. The movie, which is based on real life experiences, deals with a very young teenager who "fought" with Belarus partisans in 1943 against the brutal German occupation. He is a witness, powerless to prevent any of the horrors from happening. If you log into Blackboard and look under documents, you will see further commentary on the movie. CTE: Since my grandparents came from a small village in Belarus, this movie was especially difficult for me to watch. The movie has some very brutal scenes that are about as accurate as a movie can get dealing with the realities of World War II in Russia and how horrible, bitterly fought the war was. The movie has some typical Russian weirdness about it (the strange girl, the bog scene, the sepia-tinted flashback scene near the end of the movie), but is definitely worth watching. Screen shot from Ivan the Great part 1 CTE: In Part 1, there are some interesting camera shots, some great costuming, creative set design, nice music, unbelievable physiognomies of the actors, but it is shot in black and white and moves slowly; the sound is not that great. Technically speaking, the movie is not much beyond the stuff of the 1920s (Compare to Hollywood of the 1940s!) and is only loosely based on history; you can fast forward through a lot. But do watch the eyes of the actor playing Ivan IV, Nikolai Cherkasov. In Part 2, there is the typical Russian switch to color, like the Wizard of Oz or Andrei Rublev at the end of the film. See my comments on the first part of the movie. BB: Read Professor Blois' short article on Ivan the Terrible, Part II (*.pdf file). *Ivanovo Detstvo (Ivan’s Childhood), 1962, directed by Andrei Tarkovskii. CTE: This was the first real film by superstar Soviet film-maker, Andrei Tarkovskii (1932-1986). Ivan, about 12 years old, had his family and village wiped out by the Germans during World War II, and he ends up spying on the Germans--he does not end up happily. Basically, Ivan, as a lot of Russian children, had no childhood. Superb movie (banned by Nikita Khrushchev when first produced), in monochrome with the obligatory Tarkovskii dream-sequences. When watching, consider the impact that the war had on Russia. *Kavkazskii plennik (Prisoner of the Mountains), 1996, directed by Sergei Bodrov. CTE: Since we are not going to get any real Russian film or video that portrays the true dimensions of the conflict in Chechnya; you are going to have to watch this film, and it is worth watching. Bodrov based his movie on Lev Tolstoi's short story "Prisoner of the Caucasus" (which made it safe to produce in the climate of the mid-1990s, but it could not be made today). The film deals with two Russian prisoners who have been captured by Caucasian rebels and the ensuing attempt to trade them for a Muslim prisoner held by Russian forces. Guess what; it doesn't work. The Russians (except for the young, completely clueless soldier who is forced to grow up fast) come off very badly in this film. The film includes the obligatory, typically-Russian, mystical ghost sequence. Komissar (Commissar), 1967, directed by Aleksandr Askoldov. CTE: Only finally released in 1988--it is clear that the Soviet authorities did not like the lack of revolutionary heroic Bolshevism in the film--the film's director ws expelled from the communist party and never made another film again. Set during the Russian civil war when a Red Army Commissar becomes unexpectedly pregnant and is forced to move in and live with a Jewish family until she gives birth. She abandons her child as the film draws to a close and goes off to return to the Red Army (supposedly). I still don't really know, or undertsand, how the movie ended. There are a lot of scenes in the film of horses galloping/walking around without riders..
*Konets Sankt Petersburga (The End of St. Petersburg), 1927, directed by Vsevolod Pudovkin. CTE: Both Pudovkin and Sergei Eisenstein produced films to celebrate the tenth anniversary of the Bolshevik revolution; both took liberties with the "Storming of the Winter Palace" by the Bolsheviks; both used mob scenes to great effect; and both used montage editing techniques. Pudovkin's film differs in that it focuses on individuals, such as the peasant who later discovers that the Bolsheviks are right, rather than just the relentless Russian mob. The best part of this film deals with life in the Russian village and city before 1914. Well worth watching this classic Russian film. CTE: Set during World War II in Moscow, the movie deals with the romance of Boris and Veronica that just is not destined to end happily; he is killed while surrounded near Smolensk; she endures unbelievable tragedy. Check the scene in which she opens the door to her parent's apartment after an air raid and there is no building there anymore. The movie does show some of the sad side of the Russian home front. There are some corny sides to this movie, but reflects well the atmosphere in 1957 Russia (the Thaw); the birds are flying again. BB: Oh, no! You gave away the ending, Charlie. Well, viewers quickly figure out the ending, but still retain hope against hope, along with the heroine, that her soldier-hero will return. Also, gotta disagree. Bigtime "two thumbs up" from me. This was the first Soviet film to come to the US in late ‘50s under provisions of a new, cultural exchange protocol (we got this one, the Soviets got the 1955 Ernest Borgnine film Marty). Earlier, it had swept several Cannes awards (best film, director, and actress). A product of "The Thaw," Cranes reprises some audacious, 1920s style editing, especially at the very beginning of the film--watch for this; it goes past very quickly but is memorable. Three compelling characters emerge--a father, a son, and the son’s fiancée. Of the three, Tatiana Samoilova has the most demanding role and discharges it well if with some occasional over-acting. Aleksei Batalov, the son, volunteers to go to the front in the chaotic late summer of 1941, shortly after the Nazi invasion. In a scene that is poignant and totally true-to-life, the Red Army recruits/volunteers march through Red Square and the streets of Moscow and proceed directly to the front, then backing up rapidly in front of Moscow. I suspend disbelief very easily and always find this film very moving, never fails to dampen my eyes at the end. Things to watch for: the extended family, living in one small apartment (i.e., an honest view of Soviet living conditions); the grandmother crossing Boris as he leaves for the front; the Steinway piano; Veronika’s close brush with doing an Anna Karenina-style suicide; the death of Boris at the front, which cinematically foreshadows Bondarchuk’s swooping camera work in War and Peace and Waterloo. CTE: Well, if you like Woody Allen, then you should really enjoy this film; if you don't like Woody Allen or are a bit nonchalant about him, then there is a chance that you can still enjoy this film which is loosely a parody of Tolstoy's War and Peace and really a satire about all things dealing with nineteenth-century Russia. There is also music from Sergei Prokofiev in the background throughout the film. As with War and Peace, the immediate setting is the Russian struggle with Napoleon. For Tolstoy that setting provided the platform for developing his ideas on philosophy; for Woody Allen, that setting provided him a vehicle to ridicule, I guess, what you would call "typically-Russian philosophic ramblings." The more that you know about nineteenth-century Russian history and culture, the more that you will enjoy this movie. *Malenkaya Vera (Little Vera), 1988, directed by Vasilii Pichul. CTE: Lot of kudos from critics and publicists when this film was released, but it is now dated. The movie deals with the rebellious Vera and her stormy relationship with her parents, her lover and her youthful rebellion. It is not that great of a movie; the story is a bit old hat; the cinematography so-so; but what does make watching this thing somewhat worthwhile are the genuine scenes of life in the Soviet Union and how bad it could get for the average citizen in the 1980s; people in Western Europe and the U.S. had no idea. You can also get a glimpse of the environmental disaster that was/is Russia. Mat' (Mother), 1926, directed by Vsevold Pudovkin. CTE: Based on a Maksim Gorkii's novel of the same name, this movie is also set during the Russian Revolution of 1905. The story is one of awakening political consciousness that leads to the deaths of father, son and then mother. 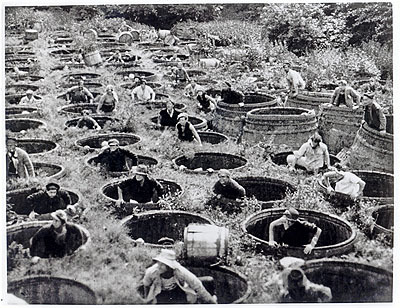 Interesting to watch the imagery sweep by and to recall that at one time, workers in Russia did not live the good life. CTE: Robin Williams as a defecting Russian? Actually the movie is not that bad. The first half of the film has some relatively accurate ideas about life in Moscow in the late 1970s (people lining up to buy anything that was available). Then the second half shifts to Williams' defection in New York. The movie somewhat realistically shows how difficult it was for immigrants/defectors to adjust to life in America (although Robin does wind-up with a beautiful girlfriend, which is not what usually happened). He has this small great scene where he speaks about his “misery” while sitting on a discarded sofa on the street; that was Russian to the core. Not a bad film; some humor. *Moskva Slezam ne Verit (Moscow Does Not Believe in Tears), 1979, directed by Vladimir Menshov. Won the 1980 Academy Award for Best Foreign Language Film. CTE: Seems so long ago that this movie was “hot” (and so long ago that I was making my students go see it in the mid-1980s). The film deals in “realistic” terms with the lives of three young girls in Moscow in the late 1950s and then again 20s years later. Basically, life is not all that it is cracked up to be, but we go on. Not a bad movie. Neokonchenaya Piesa dlya Mekhanicheskogo Pianino (Unfinished Piece for the Player Piano), 1977, directed by Nikita Mikhalkov. CTE: This film is based on Anton Chekhov's first play. A schoolteacher, doctor and other miscellaneous assorted friends and relatives gather to spend a summer weekend at a friend's dacha. You know that in Chekhov’s work there is not a lot of action, but there is a lot of conversation, introspection and drama. On one hand, this is a perfect portrayal of the follies of noble life in Russia at the turn of the twentieth century (see, especially, the glimpses of the life of the servants). On the other hand, this is pretty much what you get if you put a family and friends together together for an extended stay today. The same sort of crises, personality clashes and disputes arise. Nicholas and Alexandra , 1971, directed by Franklin Schaffner. Won Academy Awards for best art direction and costume design. CTE: 185 minutes long and bad, bad, bad. I cannot tell a lie; I did not get very far into this movie, but I know how the story ended in real life. Nostalghia (Nostalgia), 1983, directed by Andrei Tarkovsky. Won the Grand Prix For Creative Filmmaking at the Cannes Film Festival. CTE: This film has long been highly-regarded by film critics, and it won numerous awards at the Cannes Film Festival. Allegedly the plot of the movie deals with a Russian poet forced into exile in Italy in the 1970s. Now there are some interesting possibilities there as many pre-1917 Russian intellectuals and revolutionaries spent time in Italy, and a lot of Russians exiled abroad had a difficult time dealing with their forced life abroad. Let me just say, that those were not themes really explored in the movie. Simply put, this film has its problems, such as its slow pace (very slow pace), and the dreamlike dialogue. Ok. On the good side, the film is brilliantly shot; the cinematography is spectacular, and the mise-en-scene positively breath-taking. On the bad side, after watching this, you'd think that Italy was knee-deep in a monsoon season; water, water everywhere. (Tarkovskii also had a thing for water in his movie on the end of the world and in Solaris.) My recommendation is to watch if you are interested but be prepared with the fast-forward button. Offret (The Sacrifice), 1986, directed by Andrei Tarkovsky. Won the Special Jury Grand Prix at the 1986 Cannes International Film Festival. CTE: If you get to the end, let me know how it ends since I couldn't watch the whole thing. Watching the entire movie certainly does deserve extra credit. 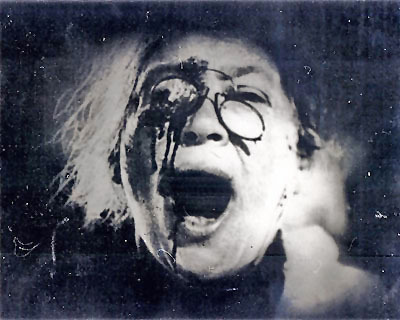 *Oktiabr (October; Ten Days That Shook the World), 1927, directed by Sergei Eisenstein. CTE: This Eisenstein movie, filmed to coincide with the tenth anniversary of the October Revolution, borrowed its English title from John Reed's book Ten Days That Shook the World. The film re-enacts the days in October 1918 when the Bolsheviks seized power in St. Petersburg from the Provisional Government. Much of the film is truly interesting from a technical point of view, i.e., the mass crowd scene storming the Winter Palace, but there is very little in the film, detail-wise, that is accurate. Despite that, for decades Western documentaries used clips from this movie as illustrative of the real events of October. The actor who played Lenin (a worker named Nikandrov) really did resemble Lenin. So, it is a bit long, but it is Eisenstein, and it does provide the viewer with a pretty accurate understanding of how the Revolution was being portrayed to the people ten years later (and also how the people understood it). There are posrtions of the movie available on the web, and sometimes you can find the entire film. *Osenny Marafon (Autumn Marathon), 1979, directed by Georgi Daneliya. CTE: Movie appeared roughly the same time as Moscow does Not Believe in Tears, but is more of a comedy dealing with an absent-minded English translator who is trying to juggle his life between the demands of wife, mistress and publisher. A Russian comedy (Exceptions aside, Russians just do not do comedy well); not bad. *Pokayanie (Repentance), 1987, directed by Tenghiz Abuladze. Won the 1987 Cannes International Film Festival Special Jury Grand Prix. CTE: Brilliant, brilliant, brilliant movie with specific Russian overtones of Peter the Great, Ivan the Terrible and, of course, Stalin. Most of the movie is a thinly-veiled attack on the Stalinist regime, here portrayed in the guise of a Georgian mayor Varlam Aravidze, an arbitrarily cruel dictator. There is also some reminder of the Godfather, but a much coarser version. There are some typically-Russian bizarre scenes that add to the flavor of the film. The movie, filmed in 1984, was immediately censored and not released until 1987 (part of glasnost'). Potomok Chingis-Khana (Storm over Asia), 1928, directed by Vsevolod Pudovkin. CTE: I’ve got to admit that I though that this would be a boring, silent film; instead, what a magnificent film, well worth watching. The film is set in 1920 Central Asia with Mongols, British and Bolshevik–although I’m sure that the partisans had little real understanding of what Bolshevism was all about–all playing major roles. The movie follows a young Mongolian trapper who is cheated out of a valuable silver fox fur by a British trader and then eventually falls in with a band of Red partisans during the civil war. Captured by the British army, he is executed and left for dead. But wait, the British learn that he is a direct descendent of Genghis Khan. He is treated and recovers, the British intending for him to play the role of a leader of a puppet Mongolian government. But wait again, it all comes unglued for the British when the original silver fox pelt resurfaces. Magnificent scenery and illustrations of life in Central Asia. *Reds (1981), directed by Warren Beatty. Won the 1981 Academy Award for Best Director. CTE: Very long movie (epic-length) devoted to the life of the American Communist John Reed (the only US citizen buried in the Kremlin wall), and author of the famed book, Ten Days that Shook the World, about the October Revolution. The film has some interesting aspects, especially abut the Russian Civil War, but also some absurd scenes (Reed on a railroad handcart trying to escape Russia). Emma Goldman is very well portrayed here. Long but kind-of interesting. *The Russians Are Coming, The Russians Are Coming! (1966), directed by Norman Jewison. Won the 1966 Golden Globe for Best Picture - Musical or Comedy. CTE: You know, this movie is not quite the comedy that it was in 1966, but there are still some very funny moments here. The movie does capture some of the stupidity of the whole Cold War and how worked up everyone was about the Russians. *Russkii Kovcheg (Russian Ark, 2002, directed by Alexander Sokurov. CTE: Unwatchful; I made it to 27:16 and that included about a three minute introduction to the film. Supposedly shot in high-definition video as one continuous, uninterrupted take in the Hermitage Museum in St. Petersburg, but it was not filmed in the usual sense of the word "film." The setting is the Hermitage with some ghosts wandering back and forth through historical settings while looking at the magnificent art collections. Strange dialogue, hard to understand the mumbling. Avoid at all costs, unless there is extra credit involved. *Sibiriada (Siberiade), 1979, directed by Andrei Konchalovsky. Won the Special Jury Grand Prix Cannes International Film Festival. CTE: What more need I say, another Russian epic. A lot of people hate this movie; I have always loved it. The movie is the tale of a remote Siberian village ("You can't go any farther than Siberia. "), the two families who live there and its transformation (yet resistance to change) over the course of the twentieth century. The mystical/spiritual side of life in the Russian countryside plays a major role in the movie. You should leave this film with some understanding of the Russian countryside. Brilliant, brilliant film. Watch closely the final fire scene in the cemetery. Sluzhili dva tovarishcha (Two Comrades Were Serving), 1968, directed by Evgenii Karelov. CTE: The movie is set towards the end of the Russian Civil War in 1920 and focuses on the storming of the Crimean peninsula by the Red Army. The capture of the Crimea, the last stronghold of the White armies, effectively ended the civil war; it also resulted in thousands and thousands of Russians setting sail on overloaded steamers in a desperate attempt to flee the Red Army and the Russia that was to be no more. While it is hard to capture on film the graphic nature of that final Crimean campaign and the incredible hardships and brutality with which it was fought, the film is an excellent movie that does give some insight into both Red and Whites. Highly recommended. Soliaris (Solaris), 1972, directed by Andrei Tarkovsky. Won the Grand Jury Prize at the 1972 Cannes Film Festival. CTE: Frankly, it is a toss-up as to which view of the future is more bizarre, Stanley Kubrick's 2001: A Space Odyssey or Tarkovsky's Solaris; both are long; both have some great music; both have long "takes"; both have a lot of white; both have unreal endings. Solaris is based on the novel by Stanislaw Lem (not sure how bizarre that is) and deals with a psychiatrist who is sent to investigate the events on a space station that is orbiting a planet called Solaris, which seems to be largely made out of water; but water with strange properties. Tarkovsky's movie contains all kinds of elements of spirituality, mysticality, surreality, bizarity. It is long and thought-provoking, and I do recommend that you watch it to see what you can discover. Stachka (Strike), 1925, directed by Sergei Eisenstein. CTE: This was Eisenstein's first movie. Commissioned by the Soviet government to celebrate the 1905 Revolution, the story deals with a strike at a factory and its bloody suppression by the tsarist authorities. The ending of the movie is extremely graphic with the slaughter of a steer interspersed with the slaughter of the workers (See the end of Apocalypse Now which is a far tamer rip-off of Stachka.). This move is certainly worth watching as it rather realistically deals with the strike process in tsarist Russia and how difficult it was for workers to really just "strike" (Of course, it was not all that easy for workers to strike under the Soviet regime either!). The movie also showcases Eisenstein's techniques and graphic special effects (for 1925), including his theory of "the montage of shocks," "juxtaposing short, separate images to heighten tension and...make dramatic and sociological points." Definitely see this movie. *Stalingrad 1992, directed by Joseph Vilsmaier (Don't even bother with the 2001, American version, Enemy at the Gates). CTE: This movie is lifted right from the pages of Erich Maria Remarque's All Quiet on the Western Front. If you know that book, then you will recognize the plot, characters and key imagery, such as Kemmerich's boots or the foxhole scene, in the new setting of the German army in 1942 at Stalingrad. No one survives. Actually, I think that the 1930 movie version is better than this movie. Stalker (Stalker), 1979, directed by Andrei Tarkovsky. CTE: Another futuristic film by Andrei "Call Me Mr. Water" Tarkovsky in which three men journey into a mysterious "zone" in the heart of Russia, trying to rediscover their faith in each other and in mankind. This very much reminded me of Joseph Conrad’s novel, Heart of Darkness. Stunning scenery. Tarkovskii (1932-1986) was one of Russia’s most acclaimed film-makers. His movies were all beautifully shot (mise en scene), meticulously choreographed (even though there is no dancing) and filled with water and the sounds of water. In addition, he always seemed to be exploring ideas about spirituality and the meaning of faith. Because his movies tended to be on the surreal side of the equation, he always faced numerous challenges from the regime in trying to make his films. I still am not quite sure what to make of this movie. Sudba Cheloveka (Destiny of a Man), 1959, directed by Sergei Bondarchuk. CTE: Produced in 1959 at the height of Khrushchev’s easing of the Russian art scene, Sergei Bondarchuk both directs and stars in this movie about Andrei Sokolov, a Soviet-soldier who is captured by Nazis and somehow survives. The film suggests the brutality of the Nazi regime, but showing that directly was impossible in 1959. Somehow Sokolov survives only to find that his entire family has been killed in the war; much as his parents and their family had died during the Civil War and famine. Film gives a good idea of the horrors of World War II for Russians. Tikhii Don (Quiet Flows the Don), 1958, directed by Sergei Gerasimov. CTE: This movie comes in a four-disc set, covering the entire five and one-half hour epic film that is based on Mikhail Sholokhov’s novel of the same name. I sat through it all. At times I had trouble keeping straight all the characters, but I could follow the general sweep of events while ticking off the family members who died one by one (the tragedy of Natalia's death). My first thought was that the movie bears nowhere near the emotional impact of the book, but my other thought was that the movie/film combo is very similar to Boris Pasternak’s Dr. Zhivago movie/film combo. I do not think that this is a result of either author, who produced very different books, but of the film directors who, in both cases, tend to focus on the intricate love lives of the main "heroes" of the movies, Iurii Zhivago and Grigorii Melekhov. Back to the Don movie for a moment, the viewer can get a good sense of the impact of World War I, the Russian revolutions and the ensuing civil war on the community of the Don Cossacks (compare early movie scenes of the prosperous village with the last scene of the almost deserted, decrepit village that Grigorii returns to at the very end of the film. Note also that the film was made at the height of Khrushchev’s policy of de-Stalinization, so it is much less formulaic and much less pro-communist. Tini zabytykh predkiv (Shadows of Forgotten Ancestors), 1964, directed by Sergei Parajanov. CTE: The film dates to the mid-1960s, and has not aged well. Captures some of the mix of pagan-Christian religion common to the Russian "people" living in the nineteenth century (or perhaps the seventeenth century); truly a strange brew. Good imagery of peasant life. Movie is mercifully short. *Utomlyonnye Solntsem (Burnt by the Sun), 1994, directed by Nikita Mikhalkov. Won the 1994 Academy Award for Best Foreign Language Film. CTE: I was not overly impressed by the film, not much action, not much plot unless you like watching some people hanging out at a country dacha for months on end. The characters were never clearly introduced. They are either hold-overs from the tsarist regime/intelligentsia or converts to the Soviet regime. We do figure out that the main character was an Old Bolshevik, an intimate of Stalin, and a hero of the Civil War hanging out at the dacha. It is not clear what he does, but he was a prime target for Stalin's purges (but that happened later in the 1930s, not 1930 when the bulk of the terror was arrayed against peasants in the collectivization campaign). I can understand the message here and perhaps the irony, (The children of the revolution destroying their parents.) and the attempt to personalize the impact of the Terror. Check out the official website. Vor (The Thief), 1997, directed by Pavel Chukrai. CTE: After watching this, I have no idea how it could ever have been nominated for a Golden Globe Award (must have been a bad year). Widowed woman with young son after World War II falls for handsome officer who just happens to be a thief, but she just can't seem to leave him. Then she dies, leaving her son an orphan. All that could very easily have happened, and I'm sure that it did in Russia. What rubbish (maybe the book was better)--although this kind of rubbish really hadn't been produced in Russia before perestroika and then the fall of the USSR. Waterloo 1970, directed by Sergei Bondarchuk. CTE: I still remember watching this thing when it appeared on TV-–it had not done well at the box office-–back in the 1970s and thinking then, what a bunch of poop. For as dramatic as the history the film purports to tell-–Napoleon’s escape from his exile on the island of Elba and the dramatic 100 days until his defeat at Waterloo by British and Prussian forces–-the movie simply lacked tension or any semblance of drama. Although filmed on a massively grand scale, with lavish costuming, and recreated historical dialogue, the film still stinks. Watch only if you must. *The World Turned Upside Down (1969). CTE: This black and white documentary uses both some rare archival film and some inter-spliced movie recreations to tell the story of the Russian Revolution. Well worth the trouble to locate a copy. There is the one clip of thousands of Russians falling down on their knees when the tsar appears on the balcony before the start of World War I; very interesting. *Zemlia (Land), 1930, directed by Alexander Dovzhenko. CTE: Rather fanciful story of some farmers in a Ukrainian village, who get together, i.e., collectivize peacefully, to purchase a tractor. The leader of the peasants is killed by a "kulak", a rich farmer who opposes any united, "collective" action by the poor peasants. Not much to the plot of the movie, and it is a silent film, but watch long enough to see Basil's funeral (Basil was the leader of the peasants); an amazing five to ten minutes of early Russian film-making at its best. Zerkalo (The Mirror), 1975, directed by Andrei Tarkovsky. CTE: The movie is allegedly about a middle-aged man on his deathbed who "remembers his past"--maybe in a drug-induced haze. Don’t believe any of those comments about the artistic beauty of this film. Watch it yourself, and see if you find it as disconnected and pointless as I did, but then again that was the 60s and 70s were like.